How To Earn Bitcoins › Forums › News › Updates › What's new? This topic contains 4 replies, has 3 voices, and was last updated by Coin Tasker 8 months ago. Hey, came back after a while, seems like many things have changed. 🙂 How are things going here for everyone now? I was wondering the same thing myself? Wanted to start making some coin but I’m not sure if the site is still going or what’s going on. Can somebody thats been active let us know if things are running smoothly? Hi, and welcome back! Due to the wild and erratic nature of Bitcoin’s price, we were forced to make some foundational updates to our payout structure. When Coin Tasker was created in 2013, it was easy for us to maintain a simple and competitive payout system because the price was only going up and it was doing so at a relatively steady pace, which allowed us to update our payout rates every few months whenever we had time. What most of our members don’t know is that it takes a couple hours for us to manually adjust our payout rates with all of our partners, and in the beginning this was OK. But as the bitcoin industry exploded over the last couple years, we found we needed to update our payout rates more and more because the drastic price changes were either causing us to lose money or causing our members not to make enough on task completions in order for us to remain competitive. Eventually, this got so detrimental and time consuming that we decided it was necessary to make an update to our payout system that would allow us to continually offer competitive payout rates no matter what the price of bitcoin is at any given time. This is a long term solution that was necessary for us to continue growing as a bitcoin earning platform and ensure our members are continually offered competitive payout rates. The changes that were required in order for this to happen are somewhat drastic, but they provide the Coin Tasker platform much more stability for long term sustainability and growth. The first thing we did was change our payout system from bits to points. Because the value of a bit changes with the price of bitcoin, it was necessary for us to create a point based system in which the value of a point does not change when the price of bitcoin changes. After creating our point system and setting the point value, the second thing we did was convert all users balances from bits to points. 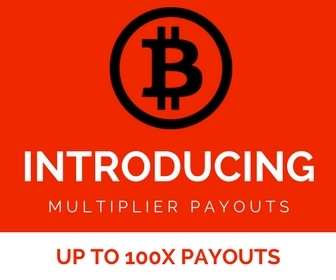 After that, we set a standard payout rate for all task walls and created a “Bitcoin Multiplier” which changes in real time based on the current price of bitcoin. When the price of bitcoin goes up, the bitcoin multiplier goes down, and when the price of bitcoin goes down, the bitcoin multiplier goes up. Right now, the current price of bitcoin is around $6,600 and the current Bitcoin Multiplier is 22X. What this means exactly is that for every point you earn from completing a task, your payout rate is multiplied by 22 in order to ensure you receive the number of points that equal the dollar value that task is actually worth. TLDR: In short, we created a point based system with a flat rate and then created a multiplier system that fluctuates based on the current price of bitcoin so our members will now always earn a competitive payout rate for all completed tasks, even if the price of bitcoin has changed drastically over the last few weeks, days, hours, and even minutes. The dollar value earned on any specific task no longer changes when the price of bitcoin changes. The payout rates are set based on US dollars rather than bitcoin prices and this means the Coin Tasker system is always sustainable and our members will always earn a competitive payout rate for every task they complete. If you have any questions, please let us know! Hi, thanks for the quick and detailed response! I understand how Bitcoin has changed drastically throughout the years, but the scaling has made withdrawals seem impossible now. Compared to a few years ago, BTC price = $400, task reward = 500 pts, it is around 20x more value. Is they any way to avoid this? Otherwise completing these tasks will of no value either way..
We will soon be lowering the minimum to withdraw to $1, but radio loyalty specifically has a much lower rate than in the past because they haven’t paid us in over two years and have avoided doing so for the last 18 months or so. Until we can get them to pay us, we can’t offer much in terms of payouts for those tasks. And unfortunately, if they continue to refuse paying us, we may ultimately need to remove them altogether.